With Photoxor Tracker you are able to track and record you path, visualize the track together with your favorite locations on a map, and quickly see what's closest to you. 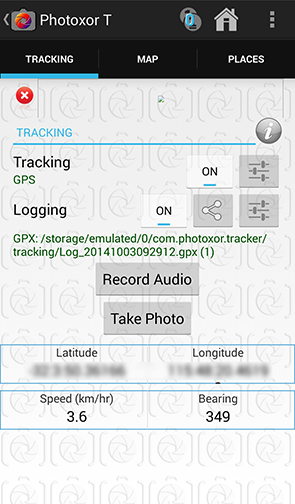 Record audio notes to quickly store information on your way, take geotagged photographs with your device camera. Store your favourite locations in KML files and load them into Tracker. 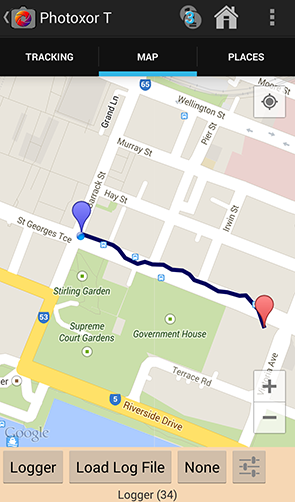 You are able to present them on the map, but also list in order of distance from your current location. Passive uses no additional power, but receives location information only when another application on your device requests it; good for background tracking. A number of in-app purchases are available to further extend capabilities. Are you are photographer, professional or enthusiast? Then also have a look at Photoxor C1; it provides tracking and additionally photography calculations.